The Rockefeller College community includes more than nine hundred undergraduates, from first years to seniors. Approximately five hundred students – first years and sophomores – live in the college, with their own dining and social facilities, study areas, computer clusters, and classrooms. They are supported by seventeen Residential College Advisers who are each responsible for a small group of advisees ("'zees") and joined by ten Resident Graduate Students who provide additional guidance and mentorship. The college contains a film theater, an art gallery, numerous rehearsal spaces and music practice rooms, kitchens, and a College library. The setting is small enough to create a sense of community, but large enough to encompass a diverse student population and a wide variety of interests. Since Fall 2007, Rockefeller College has been one of six residential colleges at Princeton, one of three that continue to house only first years and sophomores, although it provides academic advising and support for all affiliated students, both through the College staff and through faculty and peer academic advisers. The range of activities organized by the college includes intramural athletics and a wide variety of social and cultural events. Each year the college sponsors talks by faculty members, lectures by outside speakers, concerts, dances, plays, and many other events, including trips to take advantage of nearby attractions in New York and Philadelphia. Many of these activities are selected, planned, and organized by the College Council, a self-governing body made up of the student residents of the college. 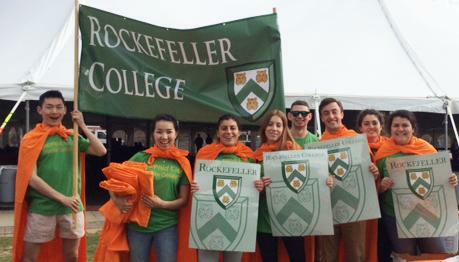 In this sense, Rockefeller College is very much a participatory community.